Shores Club 303 is a beautifully decorated, perfectly located condo very comfortably accommodating up to 6 people. Part of the beachfront Shores Club resort, it offers you complimentary access to a heated oceanside swimming pool; sunshelf with lounge chairs; clubhouse with his-and-her saunas, a fitness center, meeting areas, and more; tennis, basketball, and shuffleboard courts; picnic and barbecue areas; and private access to the beach. Best of all, of course, it brings the gorgeous shores of Daytona Beach right to the tips of your toes! Glide up on the elevator to Shores Club 303, and before you know it, you are standing in the hallway of a spotlessly maintained condo with views of the beach, ocean, horizon, and vast blue Florida sky. One entire wall of the living room is glass, so you don't have to miss a minute of the view even when you're indoors! Open the sliding-glass doors from the living room to the balcony and find yourself overlooking the beach. The Shores Club swimming pool is on your right -- handy for keeping an eye on the kids when they want to run down for a before-bedtime swim -- and a grassy lawn is on your left. Straight ahead and past the resort in both directions is nothing but pristine sands and rolling waves! The balcony at Shores Club 206 is covered, so you get a mix of sunshine and shade all day long. Everyone in your crew will want to sit out here, so in addition to the table and chairs, there are stacked chairs waiting for you to arrange as you like. Food tastes better in the open air, and the balcony is the ideal place to begin your day, with the pelicans and sandpipers as your only company while you sip coffee, finish a novel, or do a little journaling. And don't forget to come out here one more time before bed, when the stars number in the hundreds and moonlight reflects off the ocean! And when you come indoors, the view comes right with you! 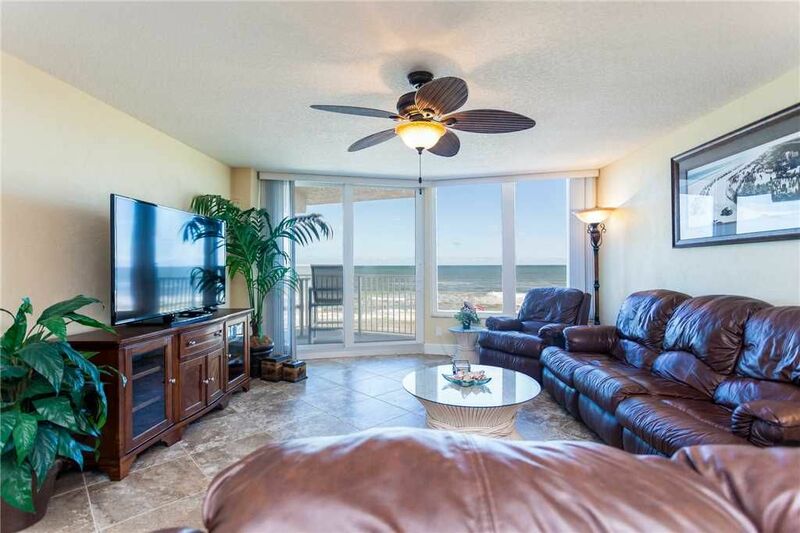 Shores Club 303 is airy and light, with cool tiled floors, palm-frond ceiling fans in most rooms, and handsome leather couches and recliner in the living room. Gather your group around the large flat-screen TV and watch a favorite movie, or break out the board games and the snacks and watch the little ones beat you at Sorry! The dining-room table is just made for games, puzzles, laptops, and tablets. It will probably become your command center: perfectly located with kitchen and TV access, plus that fabulous view. You have free WiFi at Shores Club 303, so it's easy to check the opening hours of nearby attractions in between loading vacation pics onto your Facebook page and brewing another pot of fresh coffee. Ah, those lazy vacation mornings! And even if cooking is the last thing you want to think about on vacation, the kitchen at Shores Club 303 is out to tempt you. Beautifully decorated with a tile backsplash, granite countertops, wooden cabinetry, and sparkling appliances, it contains all the cookware and serving dishes you could want. Chef's tools -- good knives and those little gadgets that are so irresistible -- fill the drawers, and a tiled breakfast bar with comfy padded chairs invite you to line up your sous-chefs and get to chopping. Still not in the mood? Okay -- use the breakfast bar as a buffet and stick to short-order nibbles and frosty beverages! That's what the microwave, blender, toaster, and double-door fridge are for! You will be delighted by the bedrooms and baths at Shores Club 303. The master suite is your sanctuary, a place you will look forward to retiring to every evening after a long, fun, wear-you-out day on the beach, at Disney (less than 90 minutes away), or the Boardwalk. Here a king-sized bed stretches out beside a wall of windows. You have your own door leading onto the balcony, and the option of leaving the drapes open to catch the sunrise or closing them tight to sleep late with no alarms. Your private flat-screen awaits you here, as does a comfy reading chair and a cooling ceiling fan. Heaven! The en-suite bath has a useful design. One vanity and closet area is set apart from the rest of the room, with a second vanity in the bathroom itself. This way, you can both get ready at the same time without bumping elbows! There is both a shower and tub option in this bathroom, and the tilework is so attractive. The guest bedroom will delight children and adults alike. Two queen-sized beds occupy this space, along with a large flat-screen, plenty of storage space, and a ceiling fan. The window can be darkened for long afternoon rests, and the second bathroom -- with a walk-in shower -- is just down the hall. All linens and towels are provided, and there's a washer and dryer standing ready to keep everything clean and dry. You're all set! Shores Club 303 make just become your Daytona retreat. The location couldn't be better, the accommodations are top-drawer and very comfortable, and the resort amenities are lovely add-ons to all the Daytona attractions. Reserve your stay here today! We always appreciate when a company fulfill their commitment; we’ll most certainly use your services again. Thank you for sharing your feedback with us. We are glad to know that you found the condo to be great and met your vacationing rental needs. If there was anything that we could have done to make your stay more enjoyable, it would have been our pleasure. We apologize if there was any miscommunication on our end regarding your reservation and hope that it did not cause you too many inconveniences. Our goal is to provide our guests with suitable accommodations for their getaway and we are sorry if you were misinformed in anyway. We will be reviewing all our property information to make sure that everything is depicted correctly so guests are given accurate details. Thank you for your understanding and your patience. It has been much appreciated as we tried to correct these issues for you. We value your input and if you should return to the area, we would love the opportunity to host you once more. Not a smoke free facility. The room was an awesome room with panoramic views of ocean! When it was advertised as smoke free I assumed the facility was smoke free with designated smoking area, not so. A little over a month out of major sinus and nose reconstruction I couldn't enjoy the balcony due to several rooms around us had smokers. This is extremely disappointing to hear. We have strict rules that there are no smoking allowed in the property but unfortunately, this may not be the case for the surrounding neighbors as there are not just visitors that stay on the property but as well as everyday residents. We can definitely speak to the association about this and see if there is anything that we can do to prevent this in the future and we apologize for the inconveniences. Disheartening and frustrating, this is not the experience we want our guests to endure especially if it is not what we promote. For the troubles, please accept 10% off your next vacation rental if you should so choose. We cannot apologize enough and although this will not make up for the inconveniences or time lost, we hope this will be a good start to making things right for you. Again, we thank you for your feedback and we hope that we will be able to host you once more in the future. Thank you for sharing you feedback regarding your recent stay! We are very glad that you enjoyed your time and apologize for the disrupted wireless connection that you were experiencing. We have taken note and will be looking into the issue further to make sure that the problem does not persist for future guest stays. Again, we thank you for your time and we would be nothing but happy to host you once more.